As the UK storage market continues to evolve, the fast moving nature of business models – previously led by large-scale projects reliant on grid services – is already bringing with it some big name casualties. Last week saw the news that Camborne Energy Storage, one of the first UK-based developers of battery storage projects, had appointed administrators earlier this summer after running into financial difficulties. With changes to National Grid’s procurement practices, combined with de-rating in the Capacity Market impacting revenues for short duration batteries that had become the mainstay of UK projects, more niche technologies are beginning to come to the fore. 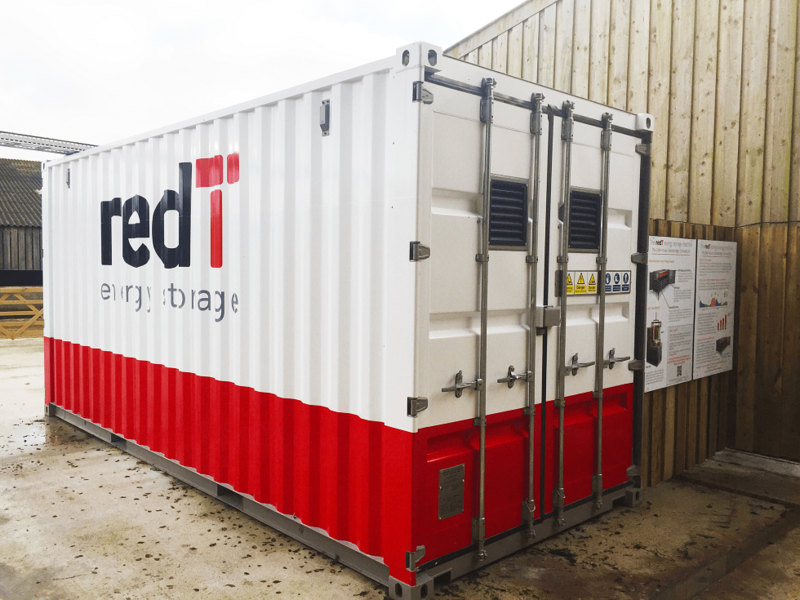 RedT energy recently agreed a supply deal with Anglian Water, which will use its flow machine energy storage units to optimise the solar generation at one of its water treatment sites, in what the company has called ‘a pathfinder for future projects’. Unlike batteries, flow machines offer longer periods of discharge duration over far more prolonged project lifetimes and for redT chief executive Scott McGregor, the company’s offering brings something new to the UK market. “Batteries have been promoted in the sector but they're very short term and they're not secure on revenues. What we're doing here is essentially building infrastructure on site so it's a very low risk investment that essentially allows the water utility to double - or more - their solar on site, which is a key target across this sector,” he explained. Unlike the lithium-ion technologies that have dominated the market, 80% of redT’s project revenues do not rely on grid services, allowing them to dodge the uncertainty that has challenged other large scale storage providers. McGregor continued: "People go with a solution because of the risk profile, which for frequency response is that it is clearly going to be oversupplied which we've been saying for years. It's not really energy storage, it's just voltage management so what we're doing here is completely different to what the battery market is doing. “This is all low risk infrastructure which allows for true distributed energy behind the meter and it's great for the solar industry because we double or more the solar on site…We're all tied to that generation behind the meter and reducing the full energy costs to Anglian, whereas the battery market to date has been looking at speculative short term policy revenues on the grid side. “There will always be grid services but the nature of those will depend on policy and different matters within stakeholders. The capex on ours when you're looking at solar and storage is quite a low risk investment so it’s not the key issue that these customers will look. This will sit there for 25 years and not need to be replaced." Over this period, the flow machines are able to de-risk the investment of both its own install but also that of solar, ensuring as much generation as possible can be used efficiently on site. The technology is also suited to high usage owing to its lack of degradation compared to battery storage which can suffer under heavy use. “Where what we sell as a storage machine is completely different to a battery is that we want to use it as much of the day as possible. It doesn't have safety, heat or degradation issues so you want to maximise your use by sizing it as small as possible with as much solar going into it,” McGregor went on. This use case has led redT to develop a proposition specifically for the water utilities sector, addressing what McGregor estimates to be 9,000 sites nationwide with high energy costs, isolated power supplies and renewable energy targets. “It's clear they have room to put on solar and storage because they're at the end of the distribution line and have the biggest gain to make from storage. It's also a sector that invests in infrastructure. “We've essentially built a purpose built solution for that sector right now and obviously what we're providing [is being met] by a lot of welcome arms. We're very diligent on our business models and our durability so we've built a purpose built solution at the moment and that's what we're focused on rolling out,” he said. With discussions ongoing, and on the back of a 700MWh portfolio order in Germany, McGregor is focused on scale with some sites being looked at for up to 2MW/10MWh behind the meter installations. "I firmly believe we have the best business models for infrastructure energy storage in the UK. We really look at the demand load, how we can really reduce the energy bills and put in the long term solution.